USB-C connector is slowly becoming a standard and we already saw desktop computers and laptops that use this type of connector. USB-C standard is similar in size to micro USB, and today we’re going to show you the best USB-C to micro USB cables and adapters. What are the best USB-C to micro USB cables and adapters? Connecting your micro USB device to your PC is rather simple, but if your PC uses USB-C port you’ll need a special cable. This cable comes with reversible USB-C connector on one side, so you can connect it easily with your PC, and micro USB connector on the other side. The cable uses USB 2.0 standard so you’re limited to 480 Mbps transfer speed. In addition to data transfer, this cable provides 3A power so you can use it for charging as well. It’s worth mentioning that the cable can work with Thunderbolt 3 port, but you’ll be limited to USB 2.0 transfer speed. MIXIT 2.0 USB-C to Micro USB Charge Cable has USB-IF certificate and it meets all electrical and mechanical standards. The cable is six feet long, and you can purchase it for $19.99. 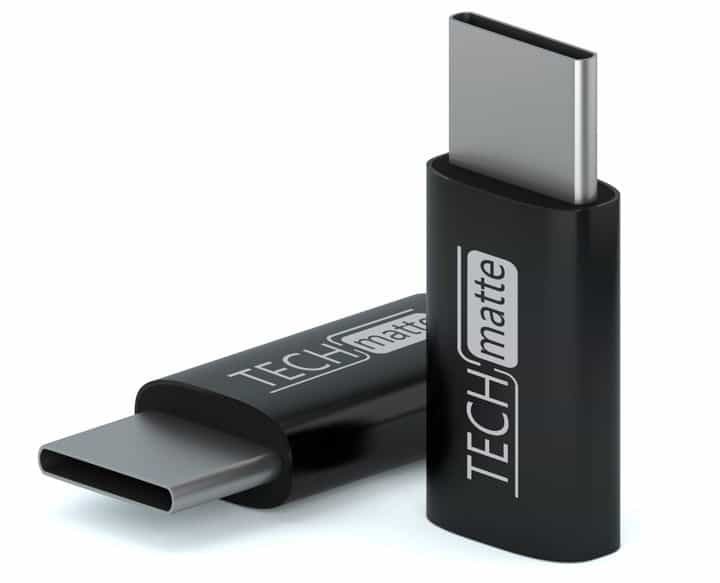 If you have a USB-C smartphone or tablet you can use TechMatte USB-C to Micro USB Adapter to transfer files to your phone. The adapter has a USB-C connector on one end and a micro USB port on the other side. Simply connect the adapter to your USB-C device and then connect the micro USB cable to it and you’re ready to use it. This adapter has a 56k resistor that will protect your device from high current while charging. In addition to charging, you can use this adapter to transfer files from your computer. We also have to mention that this adapter doesn’t support USB OTG so keep that in mind. 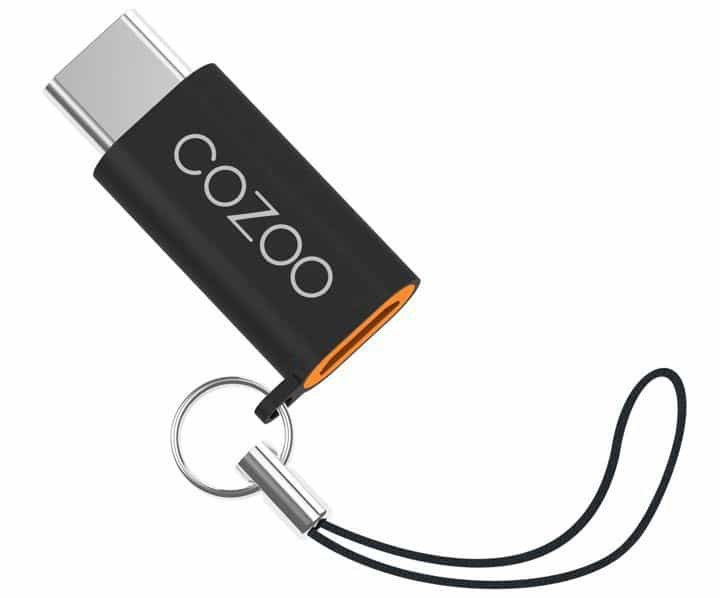 This is a solid USB-C to micro USB adapter, and it will be perfect if you have a USB-C device that you want to connect with your PC. Regarding the price, TechMatte USB-C to Micro USB Adapter is available for $6.99. To connect a USB-C device to your PC you’ll usually need a USB-C port and USB-C cable to do so. If you don’t have a USB-C port or USB-C cable, you might be able to fix this problem by using this adapter. The adapter has a USB-C connector on one end and micro USB port on the other side. The adapter is simple to use, and you just need to connect it to your USB-C device and connect the micro USB cable to the other side. The device supports charging and data transfer, so you can easily connect this device to a wall adapter and charge your phone or tablet. Regarding the file transfer, this device uses USB 2.0 standard so you’re limited to 480Mbps speed. PowerLine USB-C to Micro USB Female Adapter is a simple and useful device that will allow you to connect any USB-C device to your PC. It’s worth mentioning that this device has a 56k resistor that will protect your device while charging. PowerLine USB-C to Micro USB is available in black or white color, and you can order it for $7.99. 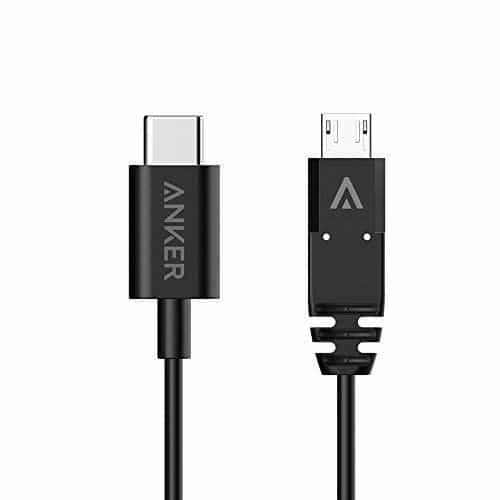 This cable comes from Anker and it allows you to connect your micro USB device to the USB-C port on your PC. You can also use this cable to charge your phone or tablet using the 2.4A current. In addition to charging, the cable also supports file transfer, but keep in mind that you’ll be limited to 480Mbps transfer speed. 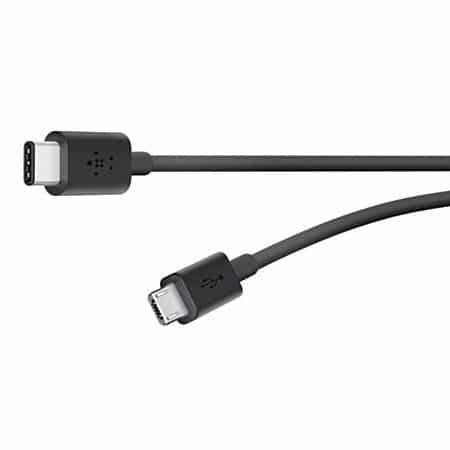 Since this is a USB-C cable, it comes with reversible connector so you’ll be able to connect the cable with your PC quickly and easily. Regarding the cable, it’s 3.3 feet long, which should be enough for most users. This is a solid USB-C to micro USB cable, and you can order it for $7.99. If you want to connect your smartphone to a PC with a USB-C port, you’ll have to use an appropriate cable. 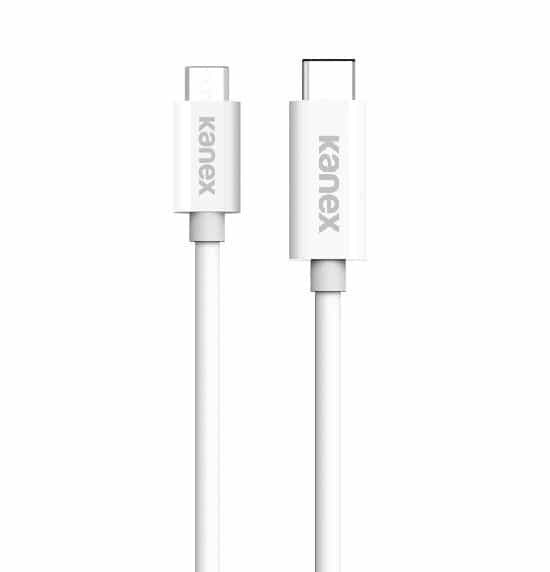 Kanex USB-C to Micro USB Cable comes with USB-C connector and micro USB port, so you can use it to connect your old smartphone to the USB-C computer. The cable supports both charging and data transfer, but keep in mind that your transfer speed will be limited to 480Mbps. This is just a regular cable, and you can easily connect it to any USB-C port. If you have a device with a micro USB port and a USB-C port on your PC, this cable will be perfect for you. Regarding the price, you can get Kanex USB-C to Micro USB Cable for $19.95. Connecting a USB-C device to your PC is simple if you have an appropriate cable, but if you don’t you’ll have to use an adapter. This adapter comes from Samsung and it has USB-C connector on one end and USB-A port on the other side. It’s worth mentioning that this adapter has a built-in micro USB connector, so you can use this adapter with micro USB cables. This allows you to connect your USB-C PC with an old smartphone or to connect a battery pack with your USB-C smartphone. This is a simple device, but it doesn’t support USB OTG, so you can’t expand your phone’s memory or attach any peripherals by using this adapter. It’s also worth mentioning that this adapter will provide transfer speed up to 480Mbps. Samsung USB Type-C to Micro USB adapter is a solid device, and you can order it for $5.32. If you want to connect a USB-C PC with a device that uses micro USB port, you need to have an appropriate adapter. LTNLab Type C to USB Micro Adapter comes with USB-C connector and micro USB port so you can easily connect any micro USB device with your USB-C computer. Of course, you can use this adapter to connect micro USB devices to your USB-C smartphone or tablet. This adapter is suitable for both charging and file transfer, but keep in mind that you’re limited to 480Mbps transfer speed. We also have to mention that there’s no support for USB OTG, so you can’t connect additional storage using this adapter. LTNLab Type C to USB Micro Adapter is a decent adapter, and you can purchase it for $7.99. USB-C devices aren’t compatible with standard USB ports by default, but you can fix that problem by using an adapter. 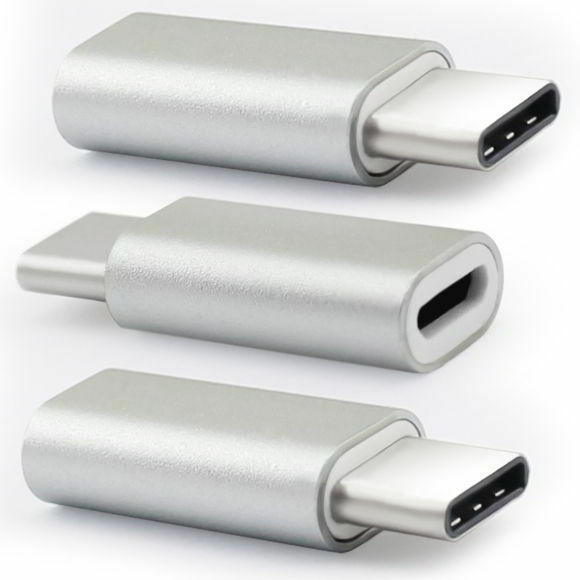 The adapter has a USB-C connector and a micro USB port, so you can connect any micro USB device to your smartphone or PC. The adapter supports charging and data transfer, and thanks to the 56k resistor your device will remain protected while charging. Regarding the transfer speed, you’re limited to 480Mbps. The device is simple to use, and it supports OTG so you can connect external storage to your smartphone with this adapter. ARKTeK USB-C to Micro USB Adapter is a solid adapter, and you can order it for $6.99. Just like any other adapter on our list, this one allows you to connect micro USB devices to your USB-C smartphone or PC. This adapter is rather small, and it has a USB-C connector on one side and micro USB port on other side. The adapter supports both charging and data transfer and it has a 56k resistor for charging protection. Regarding the transfer speed, you can achieve up to 480 Mbps. Unfortunately, this adapter doesn’t support OTG so you can’t connect USB storage or peripherals to your USB-C smartphone. 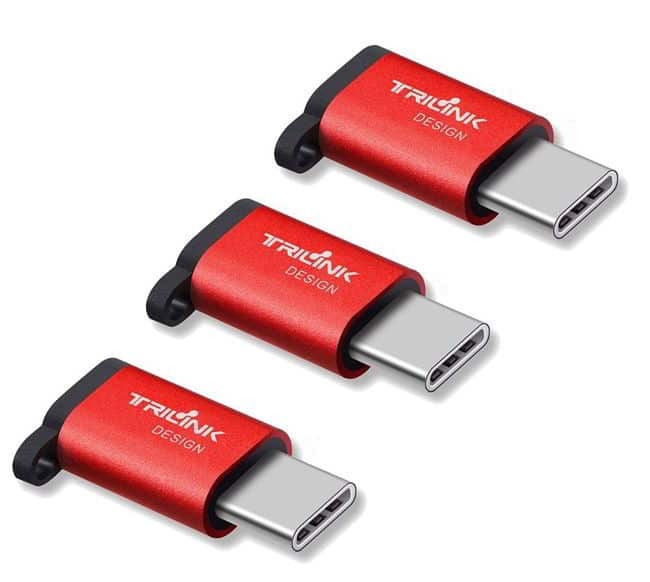 TriLink USB C to Micro USB Adapter is a solid device, and you can order it for $8.99. If you need to connect a micro USB device to a USB-C smartphone, this adapter might be perfect for you. The adapter comes with a USB-C connector and micro USB port, so you can easily connect any micro USB device to your smartphone or PC. The device supports charging and data transfer, and it’s incredibly simply to use. As for the data transfer speed, it depends on your smartphone. It’s worth mentioning that this adapter supports USB OTG so you can connect external storage to your phone, as long as the phone supports OTG. This adapter is small and simple to use, and it’s available in four different colors. In addition, models with aluminum case are also available. Regarding the price, you can get this USB C to micro USB adapter for $6.99. The main problem with USB-C port is that it won’t work with standard USB and micro USB connectors, but you can solve that problem by using this adapter. 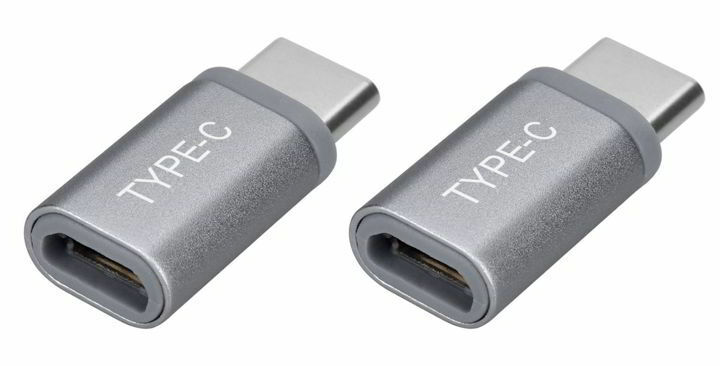 Just like any other USB-C to micro USB adapter, this one has reversible USB-C connector and a micro USB port. Unlike other adapters on our list, this one has a keychain so you can easily attach it to your keys and carry it with you at all times. The device supports both data transfer and charging, and it has a 56k resistor that will protect your smartphone or tablet. JS Collections USB-C to Micro USB Adapter is a simple device, and you can easily carry it with you at all times. The adapter is available in three different colors, and you can get it for $7.99. If you want to connect micro USB devices to your USB-C smartphone, you might be interested in this adapter. The adapter has reversible USB-C connector and a micro USB port, so you can easily connect any micro USB device to your phone. Tronsmart USB C to Micro USB Adapter supports data transfer and charging and it delivers 2.4A current and 480Mbps file transfer speed. The adapter has a keyring so you can easy attach it and carry it with you at all times. It’s also worth mentioning that this adapter supports OTG, so you can connect storage devices with your USB-C phone or tablet. 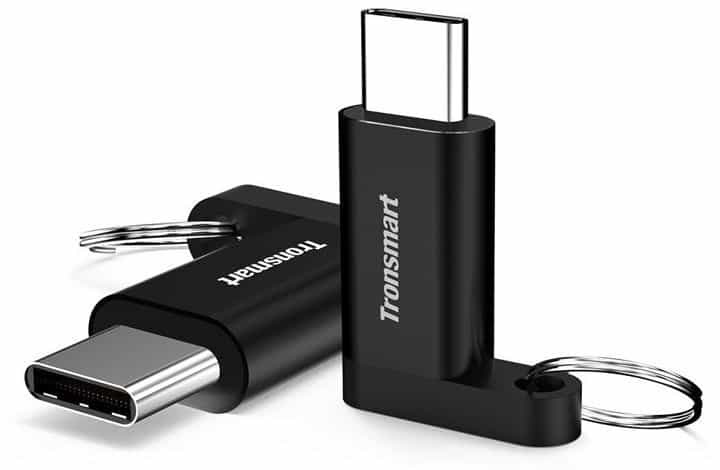 Tronsmart USB C to Micro USB Adapter is a solid USB-C to micro USB adapter, and it’s available for $7.99. 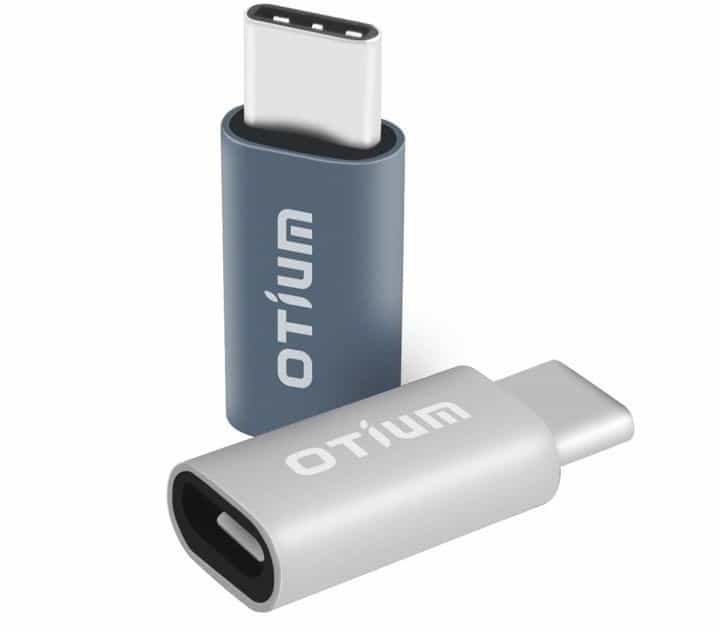 Another simple adapter for your smartphone is TOTU USB-C to Micro USB Adapter. This adapter has a USB-C connector and micro USB port that allows you to easily connect any micro USB device. This is especially useful if you have a USB-C port on your PC or a USB-C smartphone or tablet. The device is simple to use, and it supports file transfer and charging. Regarding the speed, the adapter supports 480Mbps transfer speed. As for charging, there’s a 56k resistor that will protect your device during the charging process. Unfortunately, this adapter doesn’t support USB OTG, so you can’t attach storage devices to your USB-C smartphone. 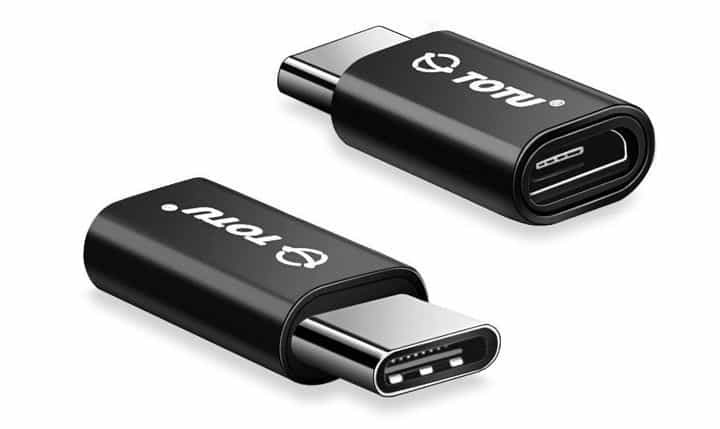 TOTU USB-C to Micro USB Adapter is a simple device, and you can order it for $7.99. Most high-end smartphones and tablets use USB-C port for charging and data transfer. Although USB-C is somewhat universal, it’s not compatible with micro USB devices. 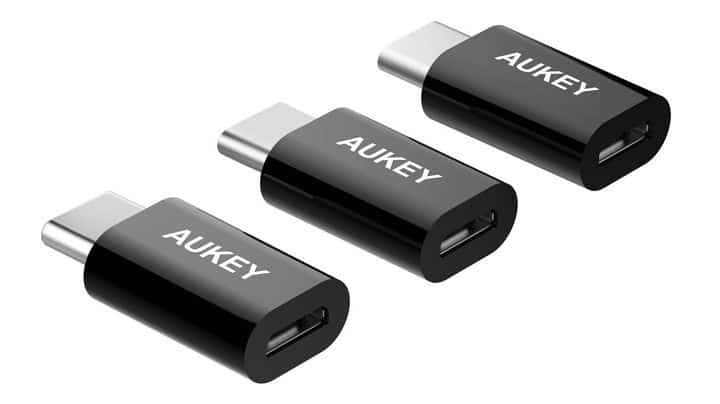 To fix this problem you need to use AUKEY USB-C to Micro USB Adapter. The adapter has a USB-C connector and micro USB port that allows you to connect micro USB devices such as battery packs to your smartphone. You can also use this adapter to connect your micro USB smartphone to USB-C laptop. Regarding the transfer speed, this device supports USB 2.0 standard so it offers 480Mbs transfer speed. This device is simple to use, and since it has a reversible USB-C connector you can connect it easily to any device. This is a solid USB-C to micro USB adapter, and you can purchase it for $7.99. If you have a USB-C device, you might be interested in this adapter. The adapter comes with micro USB port and USB-C connector so you can easily use your USB-C smartphone or tablet with micro USB devices. In addition, this adapter allows you to connect your micro USB smartphone or tablet to your USB-C computer. 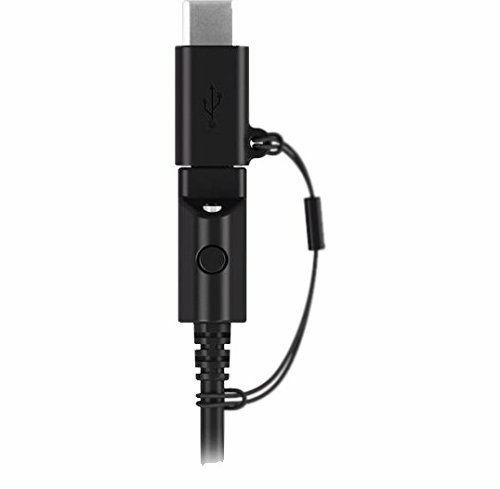 The adapter has a reversible USB-C connector, so can connect this adapter easily with any device. The device comes with a lanyard so you can easily carry it with you at all times. Verizon Micro USB to USB Type-C Adapter is a decent adapter, and you can order it for $9.99. 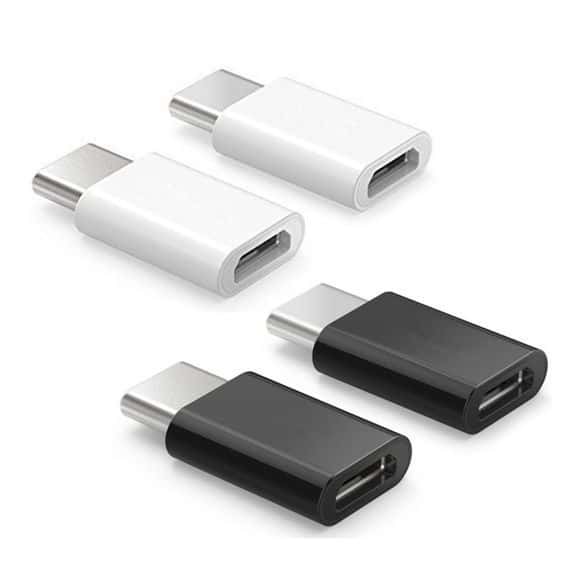 USB-C adapters are relatively common, and Whiteoak Oneplus USB Type-C Adapter will allow you to connect micro USB devices to your smartphone or tablet. This adapter supports both charging and data transfer and it’s fully compatible with older USB standards. The adapter is lightweight and it weighs only 0.56 oz. Due to its small size you can easily carry the adapter with you at all times. It’s worth mentioning that the adapter has a silicone sleeve so you can easily attach it to your keychain. The adapter has a sleek design, so it will be perfect for your smartphone or tablet. Regarding the price, this adapter is available for $9.90. If you need a durable USB-C adapter, you might be interested in this model. This device has a premium aluminum housing so it offers decent durability. The adapter has a reversible USB-C connector, so you can easily connect it to any USB-C device. Of course, the device allows you to connect micro USB devices which is useful if you have USB-C laptop and micro USB smartphone. The adapter supports file transfer and charging and it can provide 5V 3A current. Regarding the transfer speed, this adapter uses USB 2.0 standard so you’re limited to 480Mbps speed. This is a decent adapter, but keep in mind that it doesn’t support USB OTG, so you can’t connect external storage to your smartphone. 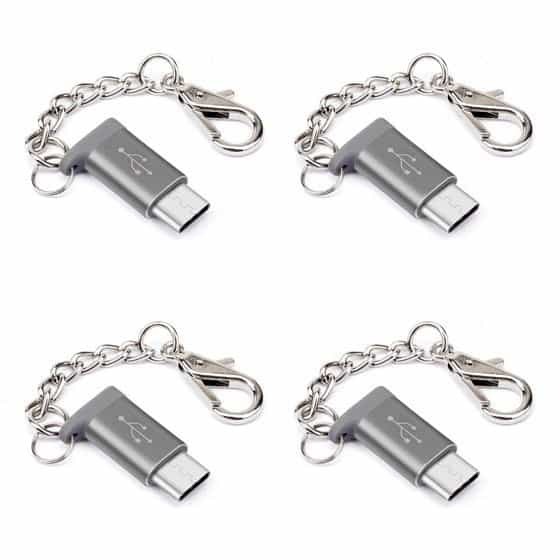 UNU USB-C to Micro USB Aluminum Adapter is available in four different colors, and you can get this adapter for $6.99. Just like all other adapters on our list, this one comes with micro USB port and USB-C connector. This adapter comes with aluminum alloy housing so it’s somewhat durable. The device offers super fast data sync and charging speed, and it should support up to 5Gbps transfer speed. 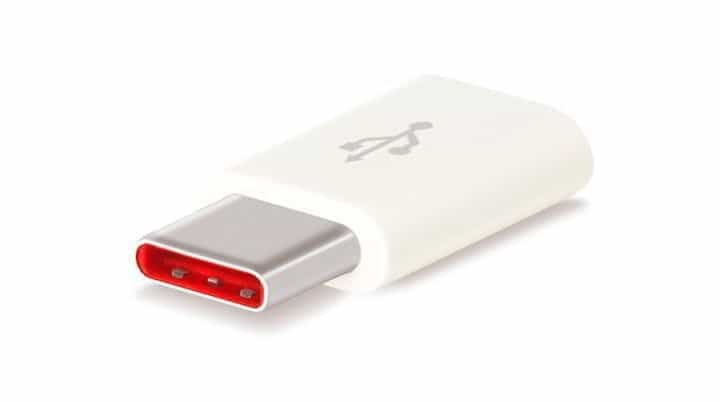 Since this is a USB-C adapter it has a reversible design so you can connect it to any USB-C device easily. We have to mention that this adapter doesn’t support OTG, so you won’t be able to use external storage with your phone. This is a decent USB-C to micro USB adapter, and you can order it for $4.99. This is another simple adapter for USB-C devices. The adapter has a reversible USB-C connector and a micro USB port available. This device has a 56k resistor that will protect your smartphone during the charging process. The adapter is simple to use and it supports both charging and data transfer. Regarding the file transfer, the adapter supports up to 480Mbps transfer speed. We have to mention that there’s no support for USB OTG so keep that in mind. 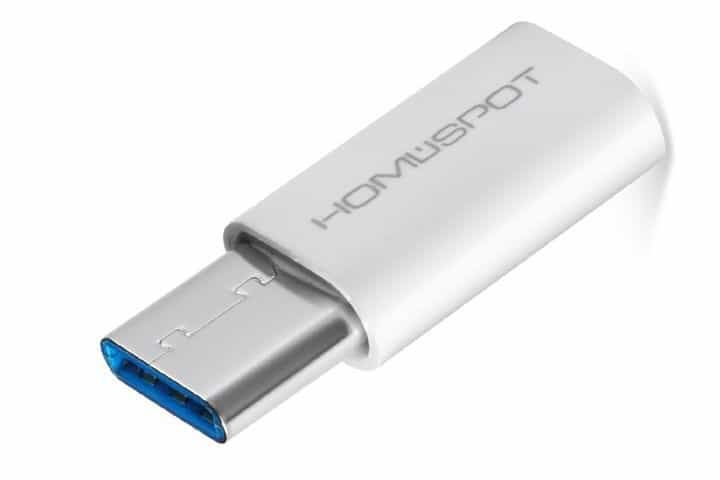 HomeSpot USB C to Micro USB Adapter is a solid adapter and you can order it for $3.99. 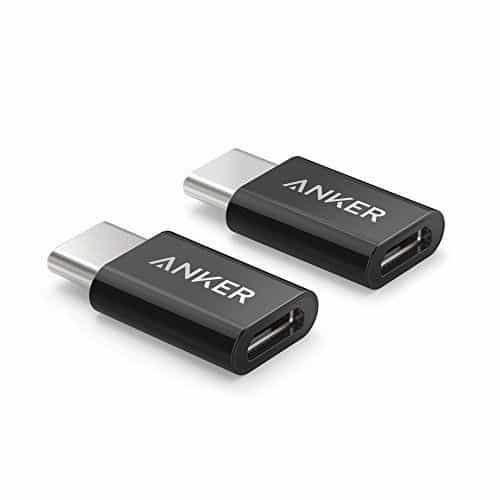 This adapter comes with simple design and it offers reversible USB-C connector and micro USB port. This is a lightweight device and it comes with metal shell so it offers sturdy design. The device supports both charging and file transfer but keep in mind that you’re limited to 480Mbps transfer speed. We also have to mention that this adapter doesn’t support USB OTG technology, so you can’t connect additional storage to your phone. This is a simple adapter, and it’s available in silver and grey colors. Regarding the price, you can get this adapter for $6.99. If you need to connect a micro USB device to a USB-C smartphone or tablet, this adapter is just what you need. This is a minimalistic adapter and it comes with single USB-C connector and micro USB port. The adapter supports USB 2.0 standard so you’re limited to 480Mbps file transfer speed. Regarding charging, the device has 56k resistor that should protect your USB-C device. It’s also worth mentioning that this adapter has lanyard design, so you can carry it with you at all times. The device supports OTG so you can connect additional peripherals or storage to your USB-C device. Regarding the price, you can order this adapter for $7.99. Since USB-C devices aren’t compatible with standard USB ports, you’ll need to use a special adapter. This adapter comes with USB-C connector and micro USB port. The USB-C connector is reversible so you can easily connect this adapter to any USB-C device. The device supports both charging and data transfer, and it’s important to mention that this adapter will protect your device thanks to the 56k resistor. This device can support up to 2.4A power delivery and it offers up to 480Mbps transfer speed. 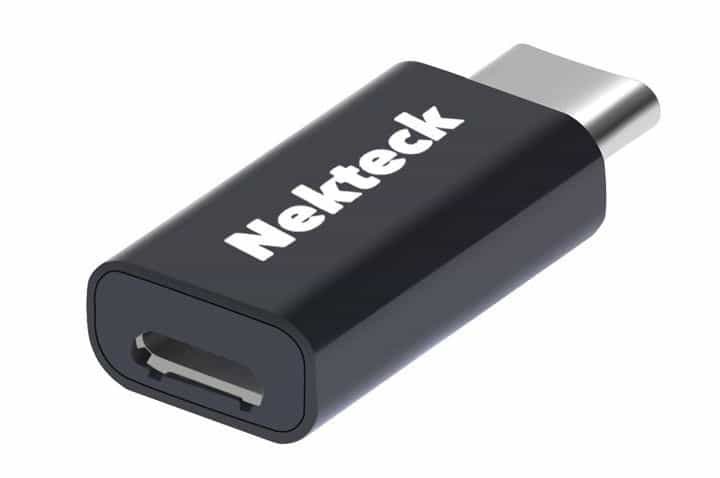 Nekteck USB-C to Micro USB is a solid adapter and you can purchase it for $5.99. USB-C is slowly becoming a standard, and if you still use micro USB devices we recommend that you consider any adapter from our list.